We will be able to combine routs and offer best deals with convenient time. 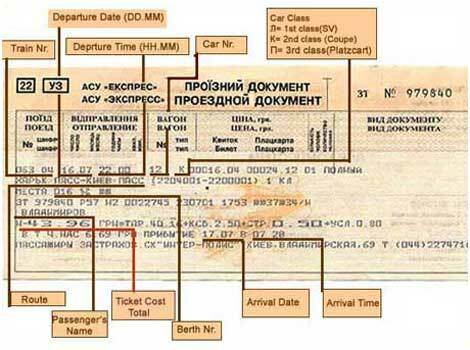 We issue train tickets on our own and it take few minutes to do so after the payment. Any Kiev train tickets routs and destinations. Full name, train number and time of the departure is required on each booking. You can send a request and we will work on the best rout but you will need to reconfirm it with us. All tickets are sold and reserved 45 days prior to the departure. All tickets are non refundable and non changeable. If you wish to change your ticket or return it could be possible done by you only. at this time this is the best type of train carriage in Ukraine that is possible to get. Every carriage consists of 9 cabins with 2 berths in each cabin. Under each berth is a space for luggage, which can hold 1-2 med size bags. There is another place for the storage and it is just above the door. There is a small unfolding table by the window. Every cabin has a door lock and can be locked from inside. There are few trains with poplar destinations like Odessa, Donetks, Moscow…. that have SW with shower cabin with toilet and one or two berths in them. Those type are rare to be booked, please ask our manager if you want to order just that kind. Each carriage has WCs with wash stand – at the front and back of the carriage. 1st class cabin has central air condition system but mostly functions when the train is moving. 2nd class is something we will recommend if you had traveled before in Ukraine or know at least few important words like – Spasibo or Dyakuyu, Borsch, Vareniki, Chay….. Though the quality depends on the train. The lower train number the better and faster the train. Same set up – 9 cabins, each cabin has 4 berths – 2 lower and 2 upper ones. There are space for luggage below the lower berths. So, who gets the lower beds or gets first may store the luggage there. Another storage space for luggage is in the niche above the door. There is a small unfolding table by the window. Every cabin has a door lock and can be locked from inside. 2nd class cabins are usually air-conditioned. But again – usually does not mean every time or each train. Each carriage has WCs with wash stand – at the front and back of the carriage. Most cases a lady – one steward serve every carriage. She will offer tea ( chay) or coffee ( kofe/kava) for a small fee at the time of checking your ticket on the train. Minuses – you never know who are the other 3 passenger – male or female and if they snore bad or not. If you take this class we recommend buying out the whole cabin. Not the best choice. Not advised by foreigners that do not speak native language and carry some cash on them. Each carriage has 54 beds, among which 36 beds ( low and upper levels) are of the normal type (in cabins) and 18 side one ( low and upper level) located (along the passageway). No doors or privacy. There is space for luggage below lower level berths in cabins. Above the upper level berths there are small space for storing the luggage but it is visible and not protected. Each carriage has WCs with washing-stands at the front and back though almost all the time one is not working and other has a line of 3-4 people a the time. But none of them smell good enough to spend more then few minutes in them. Even though it is low quality of 3rd class carriages, they are popular in Ukraine, the reason is their low tickets price. But still not much differ from the 2nd class. We will do our best not to sell you this class unless you have to travel and no other option is available. Totally un-acceptable option. Actually, this is a 3rd class carriage, for which tickets are sold without assigning exact berth numbers (or just with symbolic number of a seat ). We will not sell you this class even if you ask us to experience the trip. Driving in Ukraine is also a great option as the most famous of car rentals brands are are available to rent in the larger Ukraine cities. You’ll need an International Driving Permit; driving is on the right. Speed is in KM and we suggest not to speed as the police will be always be happy to write you a fine. Another very popular transportation option is driver rental service. We do suggest using native drivers. You can find information on car and driver rental here.